What it says on the tin. A 'Cinnamint' type. The cinnamon is the first thing that's noticed, the mint becomes noticeable later. 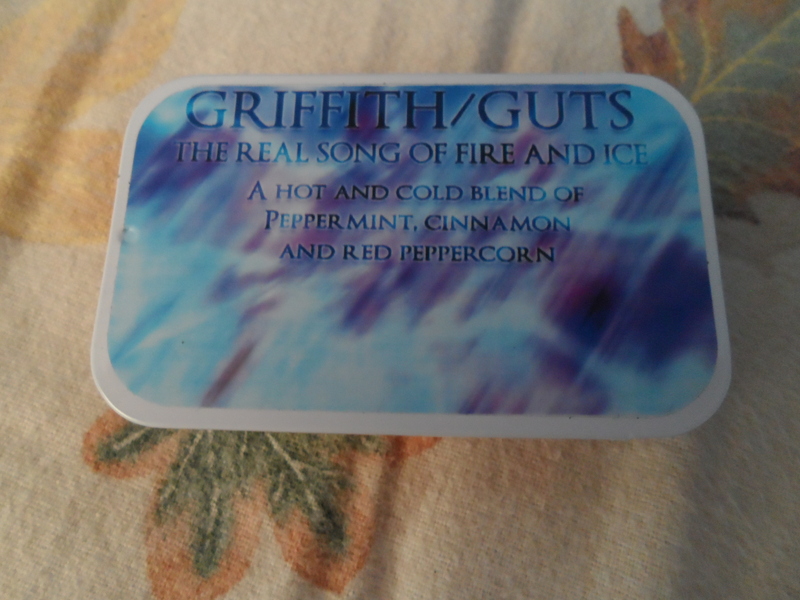 I really like it and not because it's 'Griffith/Guts'. I added no honey or sugar of any kind. Gonna try Locus, Princess Charlotte, Guts, and Slug Count next! Hope to have new blends soon! On August 26th(talk about good timing), Berserk will be the featured fandom! This means that all Berserk blends will be 20% off! So, if you want to try some or get more, Friday will be the time to do it! That's cool! Thanks for the heads up! 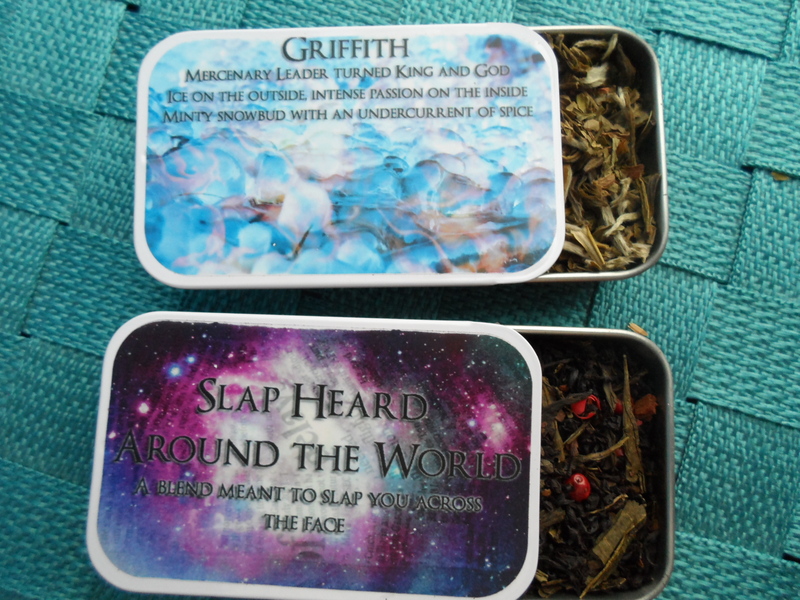 I have two new blends up: Theresia and Brand of the Sacrifice. Enjoy! It's a 20% discount for today! Not a fan of tea personally, but I have some relatives who most certainly are. I'm sure they will appreciate tea that's been damned eternally to the Vortex of Souls as a fine gift. Well, I hope they like it! 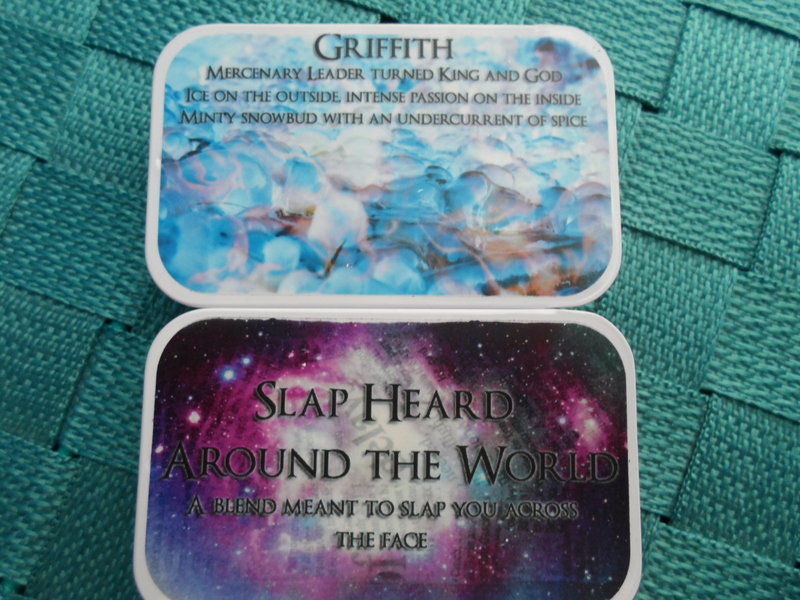 Griffith: “Mint Mint Mint! I love mint, but from what I've tried, it's ALL MINT! Snowbud? Where? Nowhere. Honestly, this tastes like flavored water. That's not Griffith's personality. Don't get me wrong, it's not bad, but I didn't detect any cinnamon and I've had stronger mints. 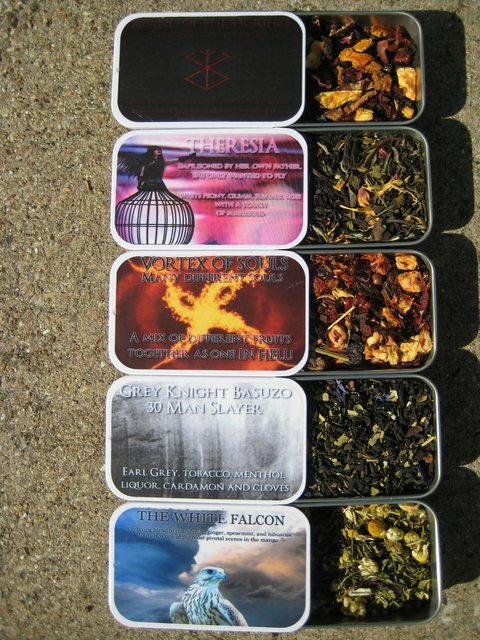 And Snowbud is apparently white tea and I tend to prefer other tea 'colors'. Still, not a bad tea, and I did not include sugar or honey, so maybe that'll make a difference. 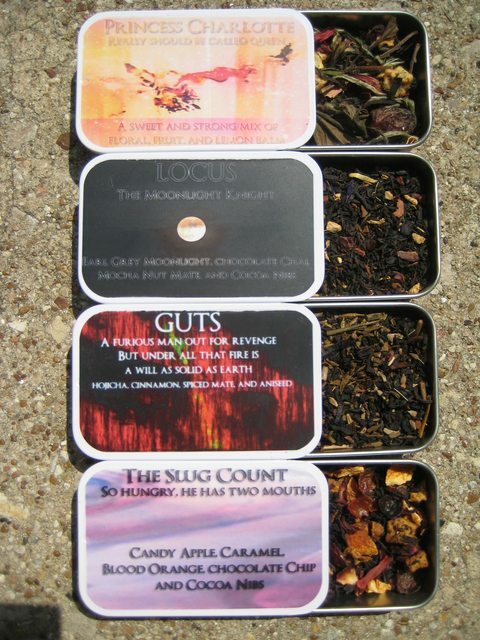 However, some people prefer subtle teas and this is one of them." Femto has a positive review! Hooray! 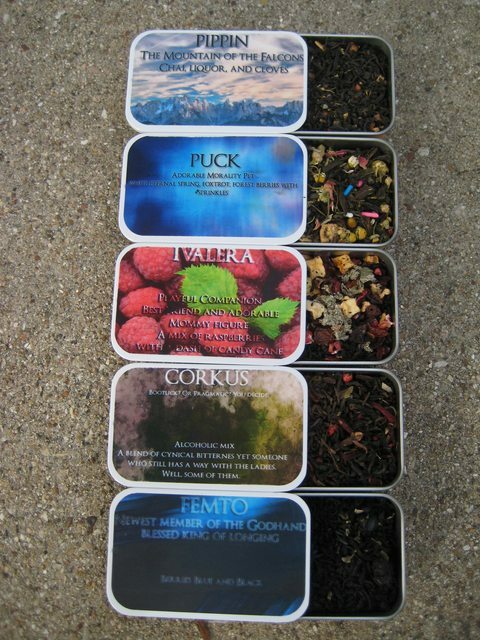 I can understand why as berry teas are AWESOME. Princess Charlotte: A lemon-ish aroma, very delicate flavor, a little on the bland side for me. Locus: Hearty, yet mellow in a way with a sweetish flavor, very tasty. 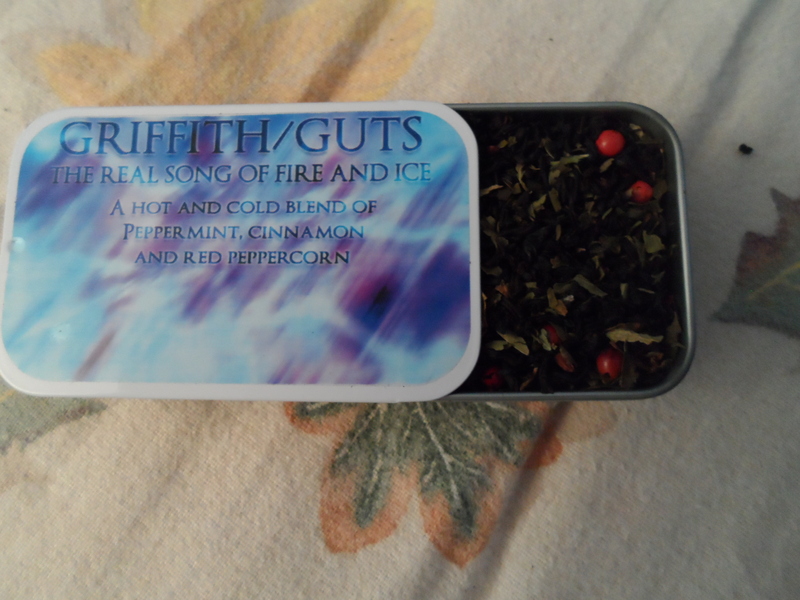 Guts: A robust tea, somewhat reminiscent of the Zodd blend, but with cinnamon. It's good. The Slug Count: Unusual, but good. Hard to describe, but I can taste caramel and fruity flavors, fairly mellow sweet flavor. I found a bag that was great for storing my tins in. It's cat approved. WOW! 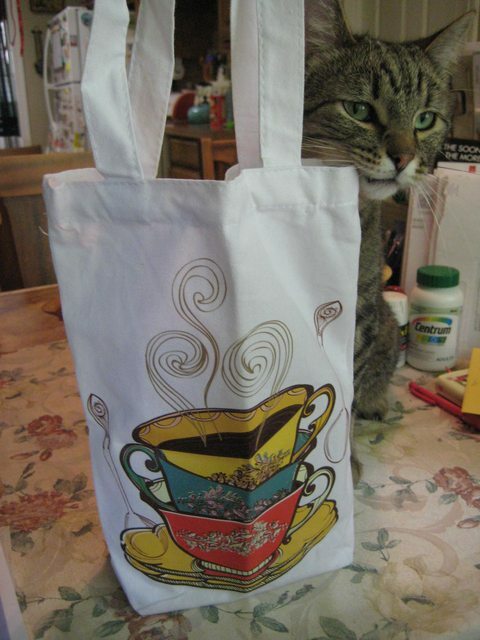 That's a nice bag and a cute cat! Brand of Sacrifice: Tasty, with a sweet cherry/citrus flavor. Theresia: Really good, has a full-bodied, creamy floral taste. Vortex of Souls: Citrusy aroma and flavor, tastes like fruit punch, pretty good stuff! Bazuso: This was a strange one. The best I can do is to say it somehow tastes like leather in a good way. Strong, masculine, and has an earthy, bold flavor. Tastes better than it smells. Overall it's a bit much. I can't decide if I like it or not! The White Falcon: Very nice, relaxing minty aroma. Hard to describe the flavor, but it's really good. Definitely would have taken Charlotte up on a refill! WOW! Great! I'm glad you like them! Tried for a blend of "drink", bitter and yet charming somehow. Hmm, interesting! Think I'll try it with my next order. Might I make a request for an Ivalera tea with raspberry flavor please? I think that would be tasty and it reminds me of her sassy attitude. Yay! Thank you! I just ordered it plus Puck, Femto, Pippin, & Corkus. Hope you enjoy! I'm willing to bet that the Ivalera one is probably very, very good. Adagio has a free shipping offer today if you didn't use points/GCs, so I couldn't resist getting Ivalera. I have a feeling that it will be a very good tea! It is good! At least in my opinion. Thanks again for making it! Pippin: unusual, but good! Before steeping it smells like gingerbread. The flavor is spicy and has a bit of a kick, but it's quite a pleasant tea. It has a warming effect apart from just the temperature of the beverage. Would be just the thing for a cold day! Puck: has a fairly subtle taste, a hint of sweetness and floral aftertaste. It's good and the sprinkles make me happy. After I drank it there was a colorful little ring left in the cup. 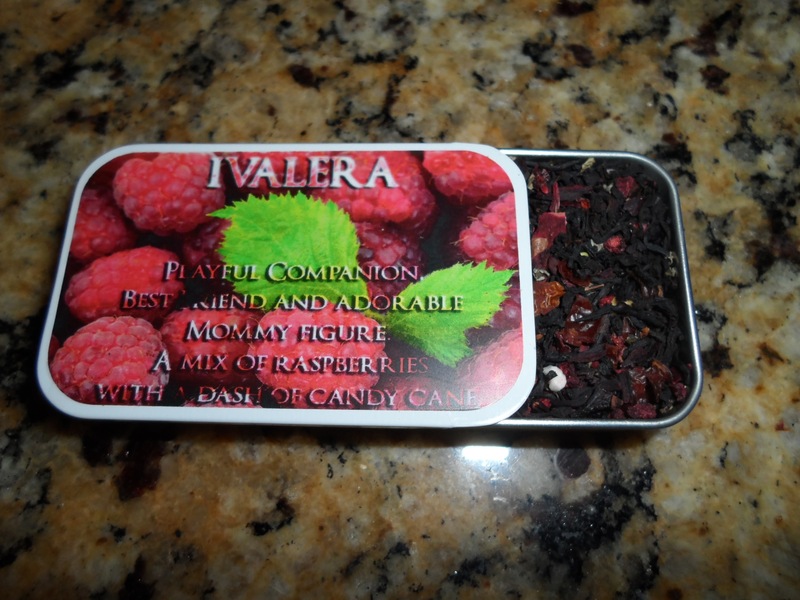 Ivalera: very tasty berry flavor and the hint of mint from the candy cane is tasty! I really like it! Corkus: hard to describe! Sounds strange, but the closest thing I can compare the aroma to is a pair of new shoes. Unusual flavor, but somehow sort of pleasant and a bit coconutty. Femto: really nice blueberry aroma and flavor! The character may be evil, but the tea is damn good! I too tried Ivalera and loved it! Solid Raspberry! I noticed that the cooler it got, the better it tasted, so I'm thinking that it will make an excellent iced tea! Thanks to the Anime/Manga Gift exchange on reddit, I was finally able to try Guts! It's quite addictive with a good, strong after taste. I just kept sipping and sipping at it. It's a solid spice tea and like I said before, I can see why it's so popular! Hopefully, I'll come up with some new blends soon! Sweet! I want to order some more different ones to try soon and stock up on my faves, Casca and Zodd.